The Huawei Watch GT looks like a classic smart watch but it’s not trying to replace your phone. Instead, it aims to be a complement, with a focus primarily on fitness tracking. However it can also receive notifications from Android or iOS devices. The construction of the Huawei Watch GT is a solid one – at least when it comes to the watch case. The 5-ATM water-resistant, stainless-steel body comes in either silver or black with an accent of either colour surrounding the watch face. This shiny, two-tone casing looks premium while the feel of it, and the sturdy click on the buttons, make it feel as well-made as it looks – the plastic undercarriage which houses the optical heart rate monitor aside. 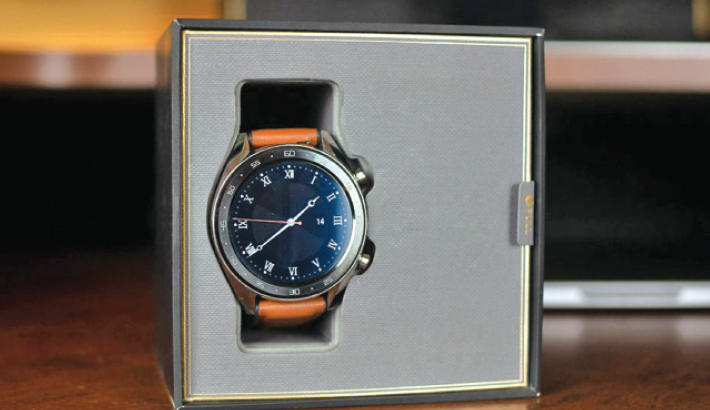 There is also the matter of the watch band, which is comprised mostly of silicone with what feels like a very thin strip of leather on the outside. It’s not a very classy feel, but it is a fitness tracker more than anything else, and the 22mm band is easily replaced. It’s a chunkier watch, though, with a 46.5-mm casing and a 1.39-inch screen that are best suited to larger wrists. The AMOLED display is bright enough to read easily in the sun light and dims well in darker situations, while the 326 ppi density does its part to making reading the watch a generally effortless affair. The GT does offer an app menu, though, which is summoned by clicking the top right physical button. The list consists mostly of apps made for viewing your exercise and sleep stats, as well as initiating various workouts through the “exercise” app; hiking, indoor and outdoor running, walking, cycling (indoor or out), and swimming in a pool or open water are options to track, as well as an “other” category for anything not listed. There are also a couple extras like a barometer, a flashlight, stopwatch, alarm clock, and compass. The secondary button unfortunately is just a shortcut to the “exercise” app – a rather redundant and effectively wasted button.